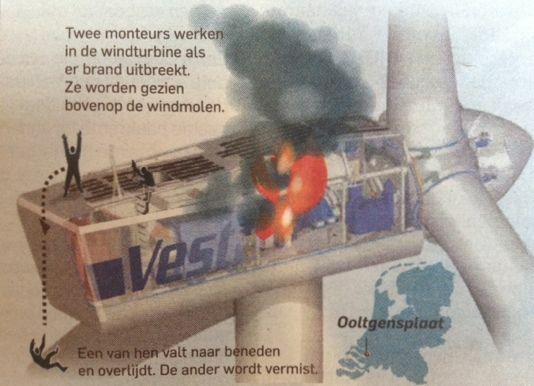 From our correspondent from The Netherlands: two wind turbine mechanics, respectively 19 and 21 years old, died because of the fire. One fell to his death and was found on the ground underneath the turbine, the other died from his burns and was found inside the charred remains of the turbine. A surprinsingly large number of wind turbines are involved in accidents around the world. Most of them are blades falling off, turbines collapsing, or nacelles burning down to a skeleton (400 - 800 litres of burning oil are not easy to extinguish, especially as firemen rarely have ladders long enough for these >100-meter long contraptions). Some human deaths have been reported. A record is being kept at Caithness Windfarm Information Forum. Some bush and forest fires have been caused by wind turbines, but such news have never surfaced, or have rapidly disappeared from the radar screen. Indeed, it's not politically correct to report such things.